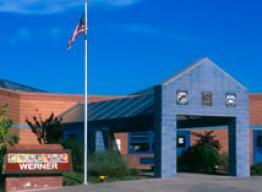 Werner Elementary School, opened in 1987, is named after Gail Werner, long-time PSD teacher and principal. The school’s unique design won national awards and served as the model for several other PSD elementary schools. Lifelong learning is enhanced through a developmentally based academic program. The Werner community is dedicated to the social, emotional, physical, and academic growth of children. In 2008, Werner received the prestigious Blue Ribbon Award from the U. S. Department of Education. It has also been recognized as a John Irwin School of Excellence by the Colorado Department of Education. Werner Elementary offers challenging curriculum with a literacy-based program and an integrated curriculum emphasizing research and critical thinking. Werner’s gifted education program and Integrated Services program assist students in meeting their individual learning potential levels. Students have a variety of enrichment opportunities, including: choir, intermural activities, student leadership, chess, foreign language, and Battle of the Books.